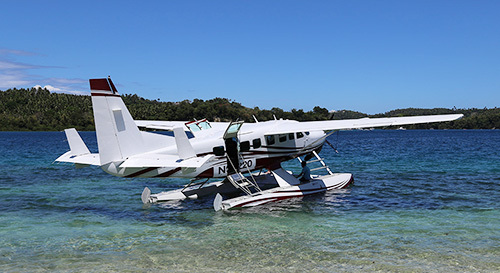 You can now fly direct to Puerto Galera from Manila via amphibious seaplane. The flight to Puerto Galera from Manila takes 35 minutes or less and is described as "simply spectacular" as it takes you over the famed Taal Volcano. Note: If you are planning to fly to Puerto Galera during high season (November to May) then advance booking is highly recommended because flights may become full days before scheduled departure. Air Juan operate daily scheduled flights by amphibious seaplane from the Cultural Center of the Philippines (“CCP”), direct to the Sandbar, Puerto Galera, on the West side of Boquete Bay. The Sandbar is about 10 minutes walk or, about 5 minutes by car/tricycle, from the Puerto Galera Yacht Club. Upon clearing either, the domestic or, the international terminals at Manila NAIA you can transfer by taxi or hire car to the Air Juan terminal at CCP (20-40 minutes from Manila NAIA by car - depending on the traffic) to board the Air Juan seaplane service to Puerto Galera. AirTrav fly from their hanger at Manila International Airport ("NAIA") direct to Friday's Resort, Puerto Galera using amphibious seaplanes; from Friday's Resort there are boat transfers to any beach within the Puerto Galera area and to the Puerto Galera Yacht Club. 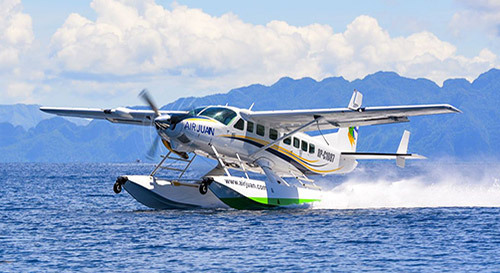 If planning to arrive at Manila NAIA you can charter the AirTrav amphibian seaplanes, which fly from their own hanger within NAIA - just a short taxi ride upon clearing either, the domestic or, the international terminals at Manila NAIA. Advance booking recommended. If seaplanes are not your cup of tea then you can alternatively, take the frequent air-conditioned bus services from Pasay City to Batangas ferry port. Recommended bus lines from Taft corner Sen. Gil Puyat Avenues (Pasay City): Ceres Liner or Jam Transit. Travel time by air-conditioned bus to Batangas ferry port is around two hours and the cost is around US$4 per person; WiFi on board. Travel time by ferry from Batangas ferry port to Puerto Galera is between 60 and 90 minutes (depending on the ferry company chosen - most people prefer Minolo Shipping Lines for the fastest trips). Please note that the last ferry from Batangas to Puerto Galera is around 4.00pm daily. Total travel time to Puerto Galera from Manila NAIA / Pasay City is between 4 and 5 hours - a good reason to consider the Fly To Puerto Galera option! If seaplanes and buses are not your thing then you can always hire a taxi or car from Manila NAIA (or your favorite hotel) and they will drive you direct to Batangas ferry port. You can expect to pay anywhere from US$65-105 for a one-way taxi/car transfer.